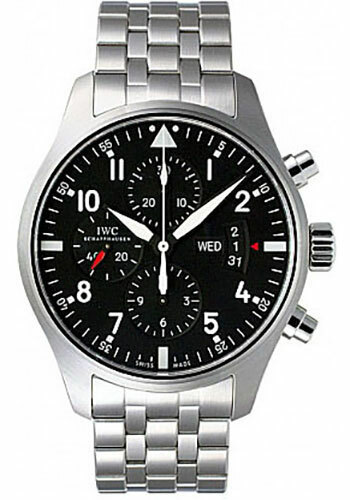 43 mm stainless steel case with soft iron inner case for protection against magnetic fields, crystal secured against displacement by drop in air pressure, screw-in crown, black dial, self-winding chronograph calibre 79320 movement with day and date display, stopwatch function with hours, minutes and seconds, small hacking seconds, approximately 44 hours of power reserve stainless steel bracelet. Water resistant to 6 bar. 43 mm stainless steel case with soft-iron inner case for protection against magnetic fields, 15 mm thick, engraved back, screw-in crown, convex sapphire crystal with antireflective coating on both sides, black dial, calibre 79320 self-winding movement with date and day display, stopwatch function with hours, minutes and seconds, small hacking seconds, approximately 44 hours of power reserve, black Santoni calfskin strap. Water resistant to 6 bar. 43 mm stainless steel case with soft-iron inner case for protection against magnetic fields, 15 mm thick, engraved back, screw-in crown, convex sapphire crystal with antireflective coating on both sides, black dial, calibre 79320 self-winding movement with date and day display, stopwatch function with hours, minutes and seconds, small hacking seconds, approximately 44 hours of power reserve, stainless steel bracelet. Water resistant to 6 bar.